Posted on Thursday, August 7th, 2014 at 10:30 am. Nestled into the canyon along Arroyo Road in the heart of Livermore Valley, Wente Vineyards is a premier wine country destination. Visitors to the historic property can enjoy wine tasting, tours of the sandstone caves, fine dining and championship golf as well as world-class concerts and private events. Wente Vineyards is America’s oldest, continuously operated family-owned winery. In 1883, C. H. Wente, a first-generation immigrant from Germany, purchased 47 acres in the Livermore Valley. Recognizing that the warm days, cool nights and gravelly soils were ideal for growing grapes, he planted vines and founded Wente Vineyards. Today, Wente Family Estates continues to be family owned and operated by the fourth and fifth generations: Eric, Philip, Carolyn, Christine and Karl Wente. The family sustainably farms more than 3,000 acres and is known as California’s “First Family of Chardonnay” for leading development of what has become America’s most popular wine varietal. Visitors can taste Wente’s famous Chardonnay and many other award-winning wines at the Vineyard Tasting Room. The expertly led tastings offer an informative glimpse into wine appreciation, and guests can browse the fully stocked gift shop. Be sure to take a tour of the historic sandstone caves (appointment required) and stop to relax on the Terrace Patio. 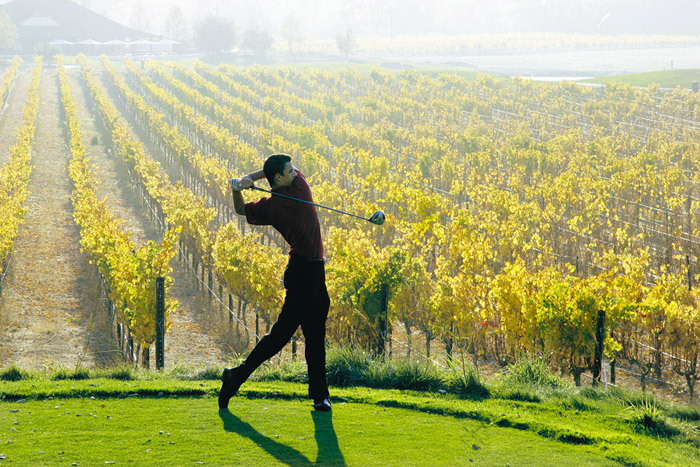 Golfers of all abilities are sure to enjoy playing The Course at Wente Vineyards. Designed by golfing great Greg Norman, the 18-hole championship course is a picturesque 7,181-yard, par-72, daily-fee golf course with three distinct topographies: native woodlands, mature vineyards and rolling hills of natural grasslands. Designed for both novice and pro, The Course has hosted the Livermore Valley Wine Country Championship, part of the PGA Tour’s Nationwide Tour. For an exceptional view of the 18th green and surrounding vineyards, visit The Grill, which offers casual fare and a full bar. The Restaurant at Wente Vineyards is an elegant place to celebrate your day in Livermore Valley wine country. Executive Chef Matt Greco offers ingredient-driven California wine country cuisine using sustainably and organically grown local ingredients. While his menu holds its foundation in American dishes, it is influenced by French and Italian provincial cuisine. The seasonal menu changes daily, utilizing fresh produce and herbs from The Restaurant’s ½ acre organic garden located on the winery property (watch LVwine.org for garden tours). The wine list offers more than 1,000 selections, providing numerous options for wine pairings. Wente also pairs its exquisite wines with music. Every summer for more than 25 years, The Concerts at Wente Vineyards has showcased world-renowned entertainers in the winery’s natural amphitheater. This month’s headliners include Frankie Valli (8/14), Earth Wine & Fire (8/26) and The Beach Boys (8/27). Wente’s Vineyard Tasting Room, golf course and restaurants are located at 5050 Arroyo Road in Livermore Valley. Find them online at wentevineyards.com. For help planning your wine tasting trip to Livermore Valley wine country, please visit www.LVwine.org.